Axway AI Suite Studio is installed over an AI Suite installation with PassPort. For more information about installing AI Suite Studio, see the AI Suite Studio Installation guide. Recommendation: install AI Suite Studio over an installation of AccountingIntegrator with Accounting Infrastructure. AccountingIntegrator comes with Rule Engine and Rule Engine Server, while Accounting Infrastructure is composed of Repository, Designer, and Administration. A Composer configuration is available, for the business flow you want to work on. One segment having the same name as the output business document. Also, an audit rule must be created for each output targeted to be imported in AI Suite Studio. It is advised to create a new application from the Repository console, and use it to deploy the configuration for the AI Suite Studio formats. An application defines a consistent set of configuration objects that will be used by one or several components. See more about Repository in the AccountingIntegrator Enabler Users guide. Export the configuration from Composer towards Designer, using the Export Finance feature. For more information, refer to the Composer Users guide. Transform the configuration using the ant command, and import it into Designer. For more information on Designer scripts, read the AccountingIntegrator User guide. In Designer, load the configuration named Base for Accounting Integration. This will give you the AUDIT_COLLECTION collection important for the injection of the audit trails. For more information, read the AccountingIntegrator Users guide. Set up the sampled data and sampled keys in the imported configuration. For each output format you must define the sampled keys and sampled data properties and for each input format you must define the sampled data properties. The sampler program uses audit trails from Rule Engine to extract relevant data to be displayed as samples in AI Suite Studio. Each property of a format, either object type or element type, can be marked as Sampled key or Sampled data. If a property is marked as Sampled key, it will be part of the key used by the sampler program to extract meaningful data from the Rule Engine output traces. If a property is marked as Sampled data, it will not take part of the key, but it will still be displayed in AI Suite Studio. All the sampled keys are automatically set as sampled data, thus they will be displayed in AI Suite Studio objects (parameters, methods, events, products). For more information on AI Suite Studio objects, read the AI Suite Studio Users guide. For each property marked as Sampled data, set the options in the Audit tab in Designer, and ensure it is present in the audit rule defined with Composer on the same format. After setting all Sampled keys and Sampled data properties, deploy the configuration on the newly created application. Use the Send to server feature to send the configuration from Composer to a server of the type AccountingIntegrator-file or AccountingIntegrator-Repository. For more information on how to do this, refer to the Composer Users guide. Deploy the configuration on the Rule Engine using the rdjdep command. This will create the mvt.xml file, from the mvt.mvt and ctx.mvt files. Note If the configuration is already deployed, then you can use the ai-config-ext command to generate the mvt.xml file. The mvt.xml file is an export of all the Rule Engine configuration and it serves as an input for AI Suite Studio configuration. Ensure the Storage is started. Use aitools tool (importMvt ) to import configuration files from the Rule Engine, then generate or import sample files. Note If the analyst decides to modify the configuration later using Composer, then you can repeat steps 3 to 6 any number of times, as importing with importMVT on an existing domain performs a merge of the new data with the existing data, according to rules detailed below. If an object is found then the new object and the existing one are merged (see below). If the object is not found, then it is created. Any objects present in the existing configuration but no longer found in the new configuration, are declared to be not currently used and are given a distinct color in the UI. Open AI Suite Studio application. Or directly access the web server landing page and navigate to the AI Suite Studio from there. Example: https://<host>:8443 if the installation was made to use the internal web server delivered with AIS (Accounting Infrastructure Services) . See in the AI Suite Studio Users Guide for the correspondence between Composer and AI Suite Studio objects. In the PassPort User interface, select Access > Privileges. 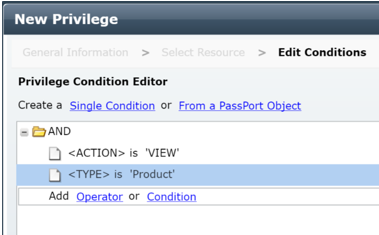 In the Privilege Condition Editor, set the conditions that must be verified to grant the privilege to the user. The privilege is now created. In the PassPort User interface, select Access > Roles. workspaceViewAll: to access all the workspaces. It is not mandatory to add this privilege, but users need rights to at least one workspace before they can access AI Suite Studio. For more information, refer to the PassPort AM documentation.